Technically the first week of May has been a great success selling 50 odd Hog Master to customer all across the UK and the world, recently selling on to Carlos in Spain who loved his new Hog Master and called us up to tell us how pleased it is with it. We had one customer last week who bought a Hog Master and was that happy with it and that pleased they bought another one in the same week. People usually sit out in the sun and get the BBQ going, stick some burgers, sausages, steaks, chicken and other BBQ food for diner or tea sitting on the outside table with a nice cold drink. Doesn’t that sound lovely, well now people are buy a hog roasting machine to use in the sunshine roasting up a pig outside with roast potatoes and vegetables now that sure sounds perfect. Now with the BBQ kit the Hog Master Hog roasting machine can be turned into a excellent BBQ which is; so much easier to clean it like cleaning a kitchen top it is that easy, I know the pain is it to clean the BBQ grills, they results you get since with the flat service top the heat is evenly placed with flamingly great results. You can hog roast then change over to the BBQ kit and then carve the pig on the BBQ kit to keep the meat hot how handy and snazzy is that. We have been providing the UK and the World with our Hog Master hog roasting machine and everyone has great things to say about our hog roasting machine the Hog Master. 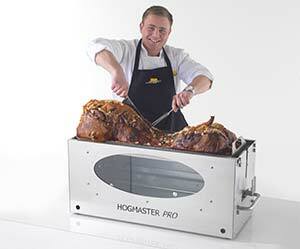 We believe it is the best hog roasting machine out there and for all hog roasting business, restaurants, catering business, mobile catering business, home users, pubs and top chefs and even some celebrity chefs out there the Hog Master is the one for you. 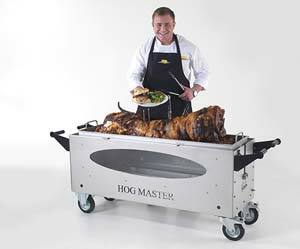 You most probably find our Hog Master hog roasting machine in most catering business, pubs, restaurants, and many other places. We hope this marvelous May can produce some amazing sales here in the UK and send the Hog Master abroad to some big countries; France, Spain, Holland, Germany, Portugal, Italy, Argentina, Ukraine, Russia, Brazil, Denmark, Bulgaria, Croatia and many other countries. We hope the Hog Master can be bought by every country out there even the little islands who I’m sure would enjoy a hog roast.